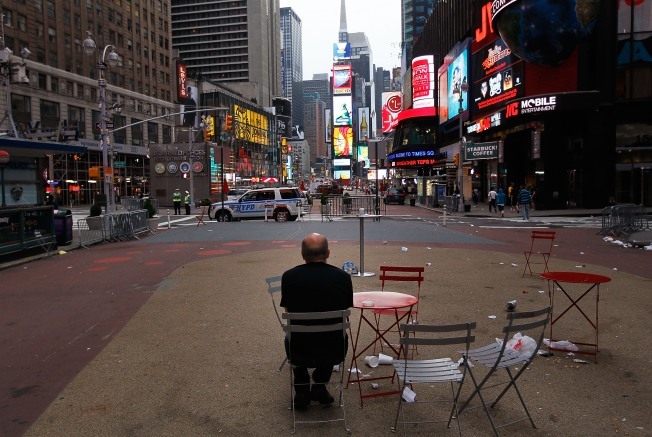 A man watches from tables in Times Square near sunrise a few blocks from where a crude car bomb had been parked at 45th Street and 7th Avenue May 2, 2010 in New York, New York. Police found a crude but potentially powerful bomb in vehicle in Times Square and disabled it, clearing out the famous intersection of thousands of tourists on a busy Saturday night. While authorities have described the failed terror attack in New York’s Times Square as amateurish, government officials and terrorism experts agreed that should the bomb have ignited, the physical damage would have been devastating. Feds arrested one man in connection with the case early Tuesday, 30-year-old Faisal Shahzad. But Attorney General Eric Holder warned the terror investigation is ongoing and urged Americans to “stay vigilant.” Even before news of Shazad's arrest, observers wondered if the person or group responsible for the bombing hasn't already succeed by striking fear into the public. What is the best response to this close call? The New York Times editorial board writes that the incident "is another reminder that New York remains a tempting target for terrorists" and supported a call for federal funds to be used to ring Times Square and the World Trade Center site with surveillance equipment. They also call for a "hard look" into why the incident wasn't stopped earlier. "Luck is a good thing. In some cases, it may be the only thing standing between us and a disaster," they write. "But no one wants to bet their security on it." The Atlantic's James Fallows argues the proper response can be see in the behavior of New Yorkers immediately after the failed bombing. Gothamites' "emotional and social response is just what America's should be," Fallows writes. "That is nothing more than: being alert, but living your life and not skulking around terrified. I hate to say that when people act fearful, 'the terrorists win,' but it's true." Foreign Policy's Brian Fishman dissects the communication strategy behind the claim of responsibility from the Taliban in Pakistan and concludes that if the bombing does have an international connection, "their message is vulnerable precisely because the attack was such a dud. One response to the attempted bombing in Times Square should be a renewed call for vigilance by citizens and first responders, but regardless of who ultimately proves responsible, it is also an opportunity for the United States to challenge the jihadists' claims of strength and power, one of many areas where they are vulnerable." The American Enterprise Institute's Marc Thiessen warns against appearing too brave and unconcerned in the face of terrorism. "If al Qaeda is not behind the Times Square attempt, this should not lull us into complacency," he writes. "The terrorists need to pull off something spectacular to prove that they are still a force and a threat...whatever the terrorists are now planning, it could very well be on a scale to equal, or even dwarf, the attacks of 9/11."